Earl Sidney Weaver (born August 14, 1930 in St. Louis, Missouri) is a former Major League Baseball manager. 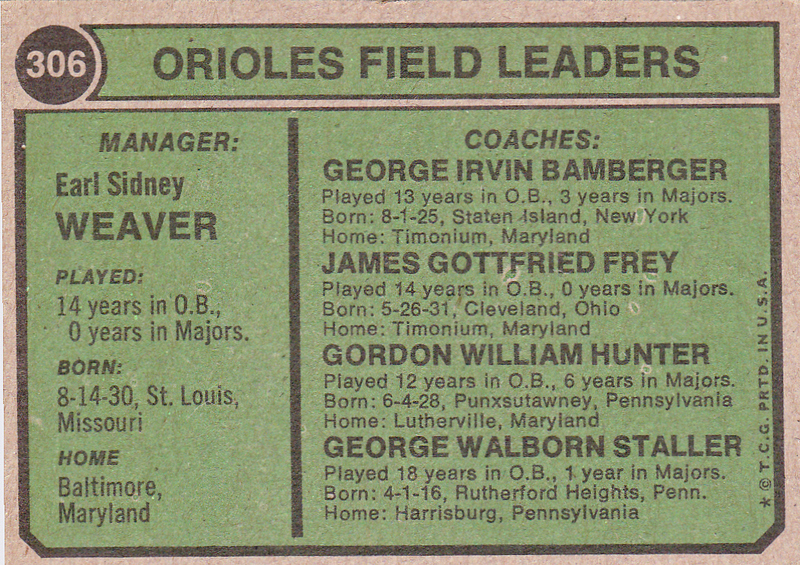 He spent his entire 17-year managerial career with the Baltimore Orioles (1968–1982; 1985–1986). Weaver was inducted into the Baseball Hall of Fame in 1996. Weaver was ejected from games at least 91 times during the regular season (98, according to one source) and several more times during post-season play. He was ejected from both ends of a doubleheader—three times. He was ejected before a game started twice (both times by Ron Luciano). Luciano alone ejected him from all four games of a minor-league series and eight games in the majors. He also received four multiple-game suspensions. He was well known for the humor that often accompanied his ejections. During one particular tirade with an umpire, Weaver headed to the dugout screaming, “I’m going to check the rule-book on that” to which the umpire replied, “Here, use mine.” Weaver shot back, “That’s no good – I can’t read braille.” He once told an umpire that he could appear on What’s My Line? wearing his mask, chest protector and ball/strike indicator and still nobody would guess he was an umpire. Weaver had a penchant for kicking dirt on umpires, and for turning his cap backwards whenever he sparred with umpires in order to get as close to them as possible without actually touching them. His rivalry with Luciano was legendary, to the point where the AL rearranged umpiring schedules for an entire year so that Luciano would not work Orioles games. In the third inning of Luciano’s first game in Baltimore a year later, he ejected Weaver—who then publicly questioned Luciano’s “integrity” and received a three-game suspension. Still, Weaver had respect for Luciano, calling him “one of the few umpires that people have paid their way into the park to see.” Marty Springstead was one of Weaver’s least favorite umpires. On September 15, 1977, in Toronto, Weaver asked umpire Springstead to have a tarpaulin covering the Toronto Blue Jays bullpen area removed; the tarp was weighed down by bricks and Weaver argued that his left fielder could be injured if he ran into the bricks while chasing a foul ball. When the umpire refused to order the Blue Jays to move the tarp, Weaver pulled the Orioles off the field, forcing the umpire to declare a forfeit: the only forfeit in Orioles history. On another infamous occasion, in Cleveland, Springstead watched as Weaver tore up the rule book and tossed it into the air. One of Weaver’s most infamous tirades came on September 17, 1980 in a game against the Detroit Tigers. First base umpire Bill Haller, who was wearing a microphone for a documentary on the daily life of an MLB umpire, called a balk on Oriole pitcher Mike Flanagan. Weaver charged out of the dugout and began screaming at Haller, who was already angry at Weaver for publicly questioning his honesty by suggesting he be prohibited from working Tigers games because his brother was the Tigers’ catcher. After Weaver was ejected, he launched into a profanity- filled argument with Haller that was duly recorded. Weaver’s contempt for umpires was often mutual. One night in 1973 Weaver threw his cap to the ground and began a vehement argument with Luciano. Luciano’s crew-mate Don Denkinger walked over to Weaver’s cap, stepped on it with the sharp cleats of both shoes, and slowly twisted back and forth. 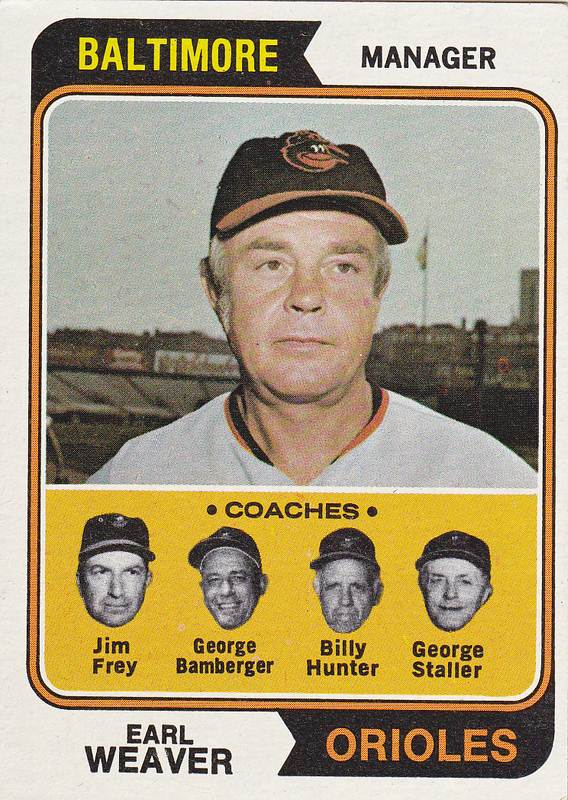 Posted in 1974, 1974 Topps, Baltimore Orioles, Manager, Orioles. Bookmark the permalink.